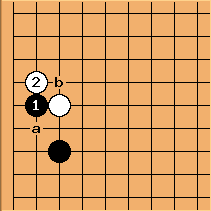 This sacrifice is a side technique, playing an attachment, aiming at sacrificing it in favour of 1, or mostly 2 forcing moves. is the attachment, and if White accepts the invitation to capture, Black cuts and forces with and , getting an influential position towards centre and below. 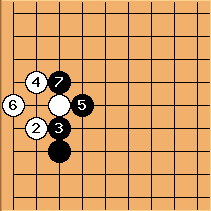 White can avoid a second forcing move by capturing immediately, but then invites a ko which is difficult to bear. The outside hane of denies the sacrifice. Connections at a and b may follow, depending on how lightly the area will be treated. 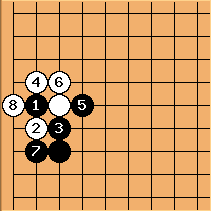 The following examples see this technique, resistance or avoidance thereof, at work in games.